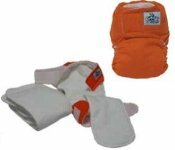 All In Two Diapers or AI2's consist of an outer water proof shell and an inner snap in or lay in soaker. Some come with stay dry inners and some do not. These diapers are a two piece diapering system. The only difference between AIO's and AI2's is that the soakers in an AI2 either snap in or lay in, while the with the AIO the soaker is attached to the diaper. AI2's are just as easy to use as AIO's, and because the soaker is not attached they will dry much faster. This feature makes All In Two Diapers very popular. I know I hate having to run the dryer all day! Moms Have Flipped Over AI2's! All In Two Diapers have become very popular in recent years with the GroVia, Flip and Softbums diapering systems. These diapers all have one thing in common - a reusable shell with interchangeable soakers. The GroVia and Softbums soakers snap in, while the Flip soakers lay in. These systems can give you great savings because you can use the covers over and over until soiled, while only changing the soakers. And the Softbums and Flips have an option for soakers with stay dry tops. Another reason these diapering systems are so popular is because they are also one sized diapers. This means that you will get long term use out of one of these diapering systems helping you to save even more money. I personally love the ease of being able to use the same cover and only changing the soakers. It makes for an easier diaper change and less of a diaper load on laundry day. Wool In Two's are a rare find, but wonderful to have. A wool in two is a wool cover with a snap in or lay in soaker made of cotton or bamboo. 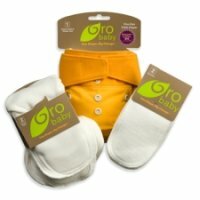 These are a wonderfully natural and breathable diaper! Sugar Peas and Chelory are some of the few companies that offer this great product. The only downside to a WI2 is if you get poop on the cover, you will have to wash it immediately so it doesn't stain. Wool does have a little more work involved in washing it, but I think it is well worth it. All In Two Diapers are easy to use and dry quickly and there are so many options out there! You can go with a stay dry solution or one with more natural fibers. AI2's have so many beautiful colors to choose from and even some adorable prints. If you go with the reusable covers, you will also save more money. I think AI2's are a great choice for anyone!